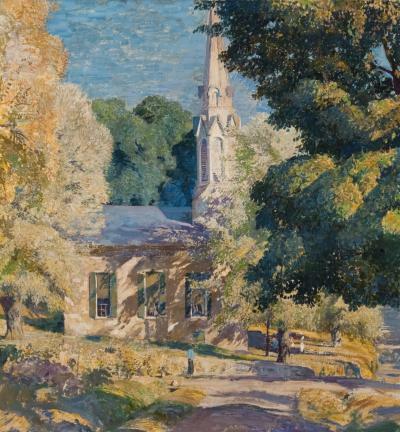 Daniel Garber, born in 1880, was an extensively trained artist working in the New Hope School style. 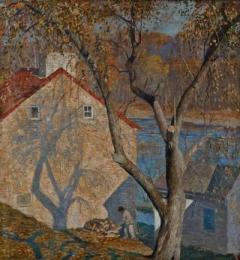 Beginning his studies at the Art Academy of Cincinati from 1897-98, Garber proceeded to the Pensylvania Academy of Fine Arts in 1899 to 1905 under Thomas Anshcutz. 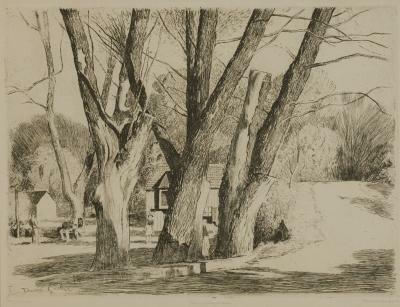 Garber also attended the Darby School in Fort Washington PA. Garber established his studio in Philidelphia in 1901 and worked as an illustrator and commercial painter while atteneding night courses at PAFA. 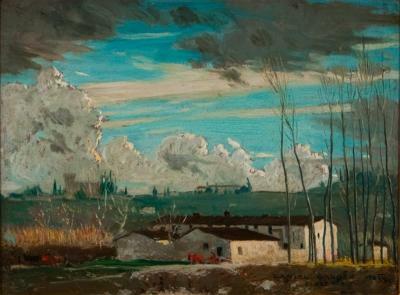 Garber became well known for his decorative, tapesry-like landscapes. 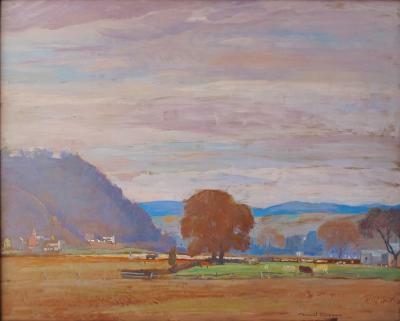 His intricate brushwork revealed panoramic views and Buck county quarries, where the New Hope School was based. Garber bathes his scenes in exquiste light. 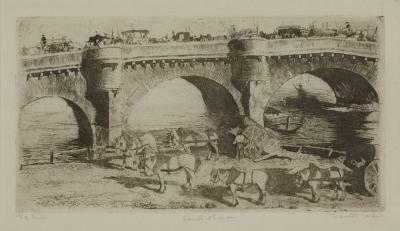 While teaching at the Philidelphia School of Design for Women, Garber was awarded the Cresson Fellowship to study abroad. He traveled through England, France and Italy. Garber was quite influential on many younger artists, inspiring geometrical harmony. Indiana born Daniel Garber became a leading Pennsylvania Impressionist in the late 19th and early 20th centuries. His pursuit of a career as a professional artist began at age 16, and from 1897 to 1898, he studied at the Art Academy of Cincinnati. 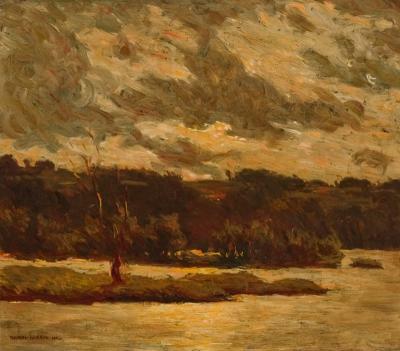 From a Mennonite family, he moved to Philadelphia in 1897 and enrolled at the Pennsylvania Academy of the Fine Arts in 1899, and during the summers of 1899 and 1900 also took classes in Fort Washington, Pennsylvania, at the Darby School of Painting, studying under Hugh Breckenridge and Thomas Anshutz. 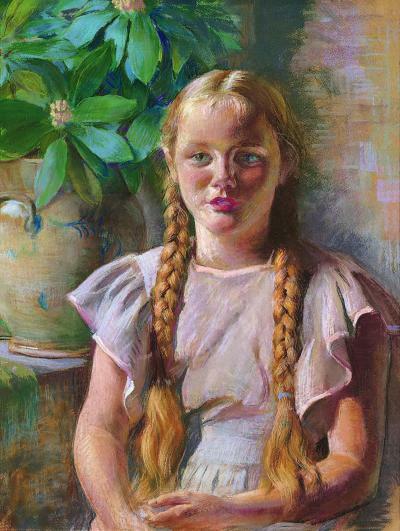 He opened a studio in Philadelphia in 1901, working as a portraitist and commercial artist. In 1905, he won a Pennsylvania Academy award, The Cresson Traveling Scholarship, which allowed him to go to Italy, England and France for two years. 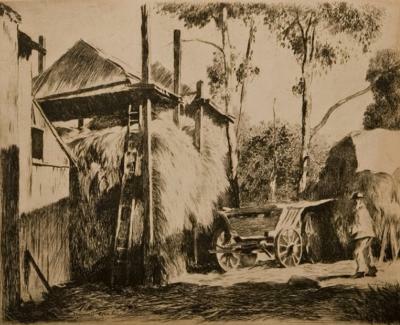 As a result, he became inspired by the works of the French Impressionists, particularly those of Camille Pissarro and Claude Monet. The European masters lent their influence, and he developed a signature style representing sunlight using a broad spectrum of pastel and bright colors, combining fantasy and realism. He returned to Lumberville, Pennsylvania, in 1907, and his mature works done in that area are perhaps some of his best. 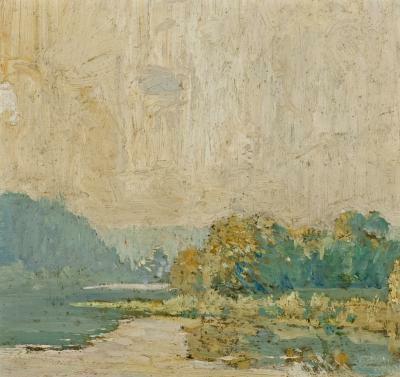 He painted in a straightforward, luminous manner, depicting the great quarries across the river in Byram, New Jersey, as well as in a more decorative, high-key mode, rendering foliage and branch patterns, as in Wilderness (1912, oil on canvas). This painting includes an element of fantasy that had begun to characterize much of the late Impressionist work in America. During the period 1908 and 1924, Garber included skillfully painted figures in most of his paintings, unlike many of his contemporaries. 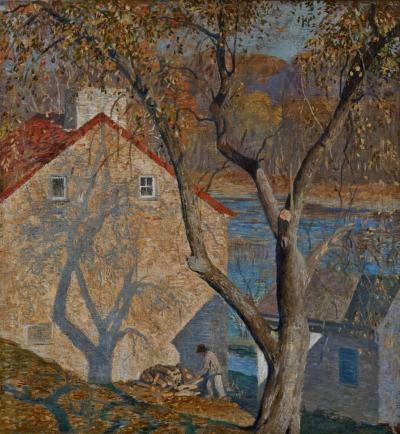 To a smaller extent Garber was a portraitist, but his landscapes of the woods and quarries of Buck's County, Pennsylvania gained him his greatest notoriety. His talents as a teacher were also evident, and he became the outstanding teacher among the group living at New Hope. He was a member of the faculty at the Philadelphia School of Design for Women in 1904, and then began in 1909 began a career of teaching at the Pennsylvania Academy of the Fine Arts that lasted forty-one years. 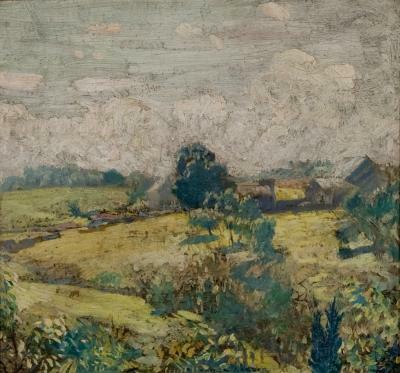 Not far from the Delaware River in Lumberville, Bucks County, Garber settled on a tranquil farm in 1907, and that provided him the inspiration for many of his works. Retiring in 1950, Garber was one of the Academy's most admired and respected teachers. Garber's paintings are represented in the collections of many museums across the United States, including the Allentown Art Museum, the Corcoran Gallery of Art, the Art Institute of Chicago, and the Metropolitan Museum of Art. 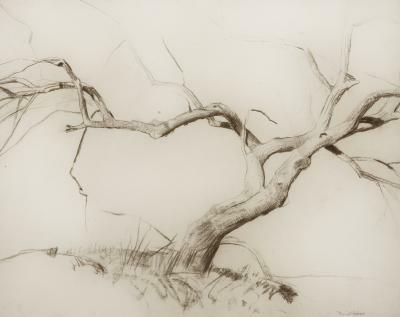 The nearly thirty awards that have been bestowed upon Garber include the National Academy of Design's Hallgarten Prize in 1909, and the 1924 Bronze Medal from the Carnegie Institute. Perhaps his most coveted was received in 1915, when he was awarded a Gold Medal from the Panama-Pacific International Exposition in San Francisco. Daniel Garber died on his farm, 'Cuttalossa', on July 5, 1958.